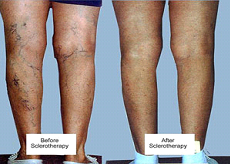 Sclerotherapy involves the injection of a solution into varicose veins or spider veins. This solution breaks down the inside lining of the vein and causes it to collapse. The dead tissue will then be reabsorbed by the body. It is a very safe method and can be used to treat both varicose veins and spider veins. It is also effective for veins in the face, but the very small ones can’t always be canulated and should then be treated with radiowaves or laser. Varicose veins are veins which are dilated and incompetent, which means that they are no longer able to function normally and thus don’t allow blood to return from the legs to the heart. They appear as unsightly dark veins on the legs, that often bulge and may cause pain. Spider veins, otherwise known as telangiectasia, are merely a small type of varicose vein. They appear as small red or purple thread veins. Doctor treats both legs in one treatment session of 1 hour. Patients wear bandages for 2 days after the treatment, but can continue with their daily activities immediately after the treatment. Usually 2-3 treatments are necessary about 1 month apart. 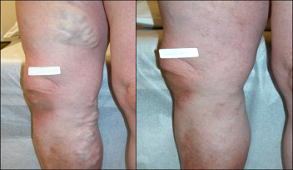 Varicose veins usually need 1 to 2 treatments per leg. Only one leg is treated at a time. The treatment takes 30 min. A medical examination is scheduled two weeks post treatment. Bandages are worn for 4-5 days. This procedure is done by Dr Nardus le Grange in his consulting rooms.